party, or just relaxing in the evening by yourself or a loved one and a good book, a glass of wine, or whatever you desire! 1.The solar panel converts sunlight during the day and charges the battery. At night, the lights will be turned on automatically and can last for 8~10 hours or more. 2.Made of high quality stainless steel and water plastic lens, designed for outdoor use. No worries about raining, snowing, frosting. 3. Solar Path Lights provide bright enough light and perfect for adding magical romantic lighting to your walkway, sidewalk, garden, or patio. 4.Easy to install, push the stake on the unit down into soft earth, It just takes a few seconds. ✔100% Solar Powered-- Save money on electricity when you use the sun. The LED lamp charged by sunlight for 4 to 6 hours can provide 8 to 10 hours illumination, realizing energy saving.16 pack LED solar path lights cast enough light to brighten your path, enhancing both visibility and safety. Lumens: 1.2 lumens. 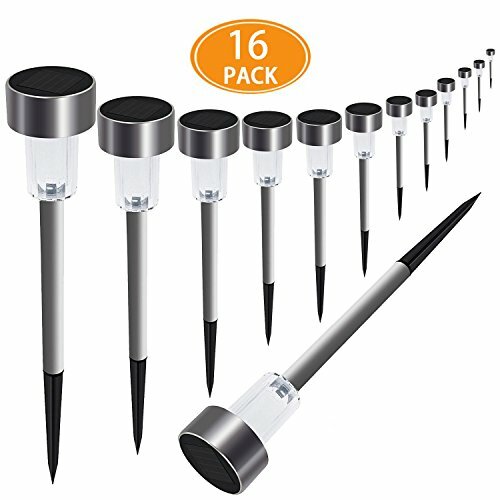 ✔Easy To Use--turn on the swit under the cap，then pull out the bottom spike, install it and insert the light into the soft earth. It just takes a few seconds. The solar path lights automatically turn on at night and turn off at dawn! ✔Low Maintenance Cost--Premium and durable stainless steel design for all weather conditions. No worries about raining, snowing, frosting, even sleeting.no battery required, and also no hassle to replace batteries. ✔Decorative-- suitable for outdoor use, the light of the water plastic lens blends well with your patio, add a charming ambience, decorate your garden, porch, yard paths and walkways. ✔100% Satifaction Guarantee--If you are not satisfied with the Solar Lights, just return them within 30 days for a full refund.Steelar SERVICE TEAM will support you . If you have any questions about this product by Steelar, contact us by completing and submitting the form below. If you are looking for a specif part number, please include it with your message.